In the cold rain lashed Pairc Ui Rinn last Saturday morning Bandon emerged victorious for a third time in 2018 over the above opponents. Duarigle Gaels played the entire second half with 14 players and were unlucky to lose two players to injury in the second period. Bandon started without the injured Robert McCarthy but Rory Desmond would prove a fine deputy over the hour. Daurigle dominated the opening exchanges and led 3 points to no score on the 11th minute primarily by being more direct in playing fast ball to their inside forwards. Bandon were by no means out of it even early on and Tome Desmond, Niall Desmond and Daithi Collis were combining well without getting a score on the board. Daithi then scored a point on the 12th minute and was fouled on the 14th minute to set up a converted free from Charlie Long and reduce the deficit to a single point. Daurigle edged 2 points back in front on the 23rd minute capitalizing when one of our defenders slipped on the rain soaked pitch but we went ahead on the 25th minute 1-2 to 0-4 when Jake Lillis goaled by being in and around the goalmouth after a very good pass in by Daithi Collis. Rory Desmond scored a lovely point soon–after and just before the small whistle Daithi Collis scored our second goal 2-3 to 0-4 after a very short kick-out went astray. There was further trouble for Duarigle on 30 minutes when they lost no 15 to a second yellow and a red card for persistent fouling and rough play. It was difficult to see any advantage accruing to us from the extra man for a about 15 minutes of the second half as it was Duarigle who threw off the shackles and ran at us and came to within 3 points 2-4 to 0-7 on the 15th minute spurned on by their very influential No 9 Darragh Cashman. 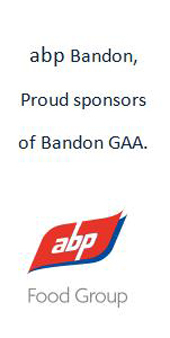 They then missed a goal opportunity after Oisin Doyle fisted out a goal bound effort and that was that and Bandon’s extra man and better general play counted for a lot after that. Cathal Lynch and Gavin Lowney were excellent throughout, Charlie Long scored our three second half points, one from play and two from frees and Daithi Collis was my man of the match. It is a great achievement for this bunch of players and their mentors to win their fourth County Final in three years.